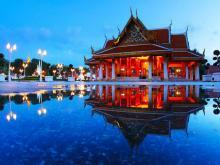 Wat Benchamabophit, also named as the marble temple, is one of Bangkok's most beautiful temples. It illustrates Bangkok's ornate style of high gables, stepped-out roofs and elaborate finials. Situated in Si Ayutthaya Road, next to Chitralada Palace, the marble temple is world-famous and has become a major tourist attraction in Thailand. Its ordination hall holds a Sukhothai-style Buddha statue with the ashes of King Chulalongkorn buried beneath it. The surrounding gallery displays 52 Buddha statues with different mudras (signs). The temple was featured in the famous The Amazing Race 9 as the 10th and final elimination pit-stop. The best time to visit Wat Benchamabophit is in the morning when you can hear the solemn sutras chant of monks echoing in peaceful atmosphere.